In the late 1960's Holden were at the forefront of experimental car design. Most know of the wonderful GTR-X, but only a handful will truly remember the Hurricane. Unlike the GTR-X, the Hurricane was never really intended to make it into production. 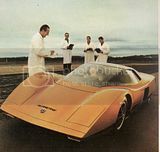 Rather, Holden described it as an experimental research vehicle, allowing them "‘to study design trends, propulsion systems and other long range developments". Revealed in May 1969, the wedge-shaped, mid-engined V8 Holden Hurricane was quite unlike other modern show cars of the era, which tended to reveal more of what the manufacturer would be releasing with the next incarnation of a particular model. Instead the Hurricane was always a developmental concept, a dream car with no serious intention of it ever becoming a reality. Like the GTR-X, the Hurricane was developed as a two-passenger vehicle, and boasted an arsenal of (for the time) advanced technology. Before you scoff at list of features the Hurricane featured, try to remember the year was 1969! Few had even heard or understood what electronic digital instrument displays were, nor what an auto-seek feature was on the car radio. As its code name suggests, RD 001 was the first product of the GMH Research and Development section, staffed by a small squad of engineers working in conjunction with the Advanced Styling Group at the Fishermans Bend Technical Centre. RD 001 stood just 990mm high and had no doors in the conventional sense. An electro-mechanically powered canopy swung forward over the front wheels, combining with twin "astronaut type" power elevator seats which rose up and pivoted forward, along with the steering column, for ease of access. Occupants were lowered to a semi-reclining position and the roof closed over. The car could not be started until the canopy was locked down, the seats fully lowered and the driver"s fully retractable, automatically locking seat belt secured. Among other safety innovations were a foam-lined fuel tank, integral headrests, the digital readouts, interior padding and a fire warning system. The wind tunnel-tested fibreglass body was finished in an experimental aluminium flake-based metallic orange paint and mounted on a steel box section perimeter frame with rubber insulated mountings. Under the Hurricane"s pivoting engine hood, set forward of the rear axle, was an experimental 253 cubic inch Holden-designed and built V8 with a four-barrel carburetor.